Alternative models of watershed protection that balance recreational use and land conservation must no longer be ignored to preserve water supplies against the effects of climate change, argues a new study. Researchers claim that the management of Salt Lake City's Wasatch watershed in Utah provides a valuable example contradicting the dominant view presented in academic literature that informs many current conservation strategies. Salt Lake City's preservation of the Wasatch watershed is an important model for protecting urban water sources through land use regulation and conservation, which could have important implications for preserving future water supplies against the effects of climate change in the American West, according to a new study. This example is currently absent from academic literature on ecosystem services, meaning that conservation discussions are instead dominated by models that focus on financial, 'market-based' incentives to protect watershed areas, which the researchers argue could be inappropriate in many circumstances. The most prevalent model for water resource preservation is that of New York City's Catskills/Delaware watershed, which is based on upstream resource users being paid to avoid harmful practices that might affect water flows and water quality, typically by beneficiaries who are downstream. These 'market-based' approaches (also known as Payments for Watershed or Ecosystem Services) have been widely promoted, but risk neglecting alternative approaches that do not always require monetary transactions to improve environmental outcomes. In contrast, Salt Lake City's management strategy allows regulated use of the watershed area for public recreation (unlike other forested catchments in the US where public access is prohibited to preserve water resources). 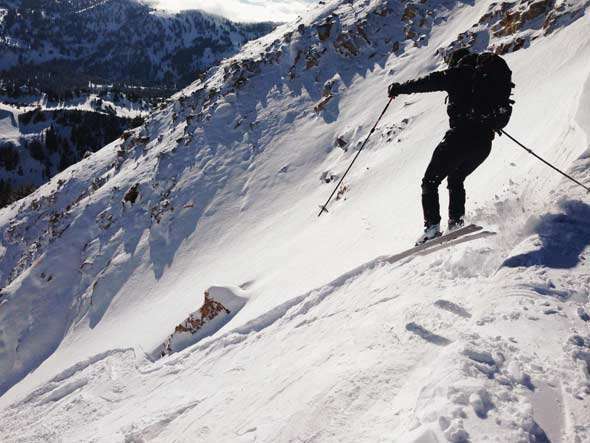 In the Wasatch case, this means that the upstream catchment remains accessible, including for high impact uses such as skiing and mountain biking. Researchers argue that it is vital to consider these alternative strategies for solving the increasing water scarcity in the American West. "While regulatory exclusion is often thought of as the only viable alternative to market-based incentives in managing ecosystem services, the management of the Wasatch watershed provides a third, yet under-recognised, successful conservation strategy for water resources," says Libby Blanchard, lead author of the study from the University of Cambridge's Department of Geography. "The dominance of the Catskills example in discussions of watershed protection provides an unduly limited, and historically incomplete, perspective on interventions to secure water resources, and limits policy discussions about alternative conservation approaches," she adds. In the American West, unprecedented droughts have caused extreme water shortages. The current drought in California and across the West is entering its fourth year, with precipitation and water storage reaching record low levels. Droughts are ranked second in the US in terms of national weather-related economic impacts, with annual losses just shy of $9 billion. With water scarcity likely to increase due to advancing climate change, the economic and environmental impacts of drought are also likely to get worse. "The chances of a 'megadrought' – one that lasts for 35 years or longer – affecting the Southwest and central Great Plains by 2100 are above 80% if climate change projections are not mitigated," says Blanchard. "As the West faces more frequent and severe droughts, the successful protection of watersheds for the ecosystem services of water capture, storage, and delivery they provide will be increasingly important." "The sufficient and effective protection of watersheds will become more challenging, so awareness of alternative, successful strategies is critically important," adds Bhaskar Vira, co-author of the study also from Cambridge's Department of Geography. "The management of the Wasatch is one such strategy that should be more widely recognised amongst policymakers and researchers alike seeking effective solutions to water scarcity." The economic and instrumental value of the Wasatch watershed was noticed by Salt Lake City's government as early as the 1850s, when the first legislation to protect the city's natural resources was passed. Salt Lake City uses two tools to protect its watershed: purchasing land for conservation, and regulating land use by restricting a variety of activities within the watershed such as cattle grazing. Recreation is not altogether restricted, but is negotiated with the local community to allow public use. The Uinta-Wasatch-Cache National Forest is one of the most heavily visited national forests in the US, with 7 million annual visitors. "Salt Lake City has been able to preserve the natural capital that protects its watershed while allowing recreational use. The preservation of the watershed actually boosts recreation, providing visitors with natural landscapes and unadulterated settings for mountain biking, hiking, skiing, and fly-fishing," says Blanchard. The city raises funds to buy land within the watershed through a surcharge on water customers' monthly bills, which provides around $1.5 million each year to protect watershed lands from development. Since 1907, the city has managed to purchase over 23,000 acres of the watershed. "Despite the popularity and power of the Catskills narrative to promote the preservation of ecosystems via market-based incentives, we found that this narrative is at best partial, and quite possibly flawed," says Blanchard. "The Wasatch's absence in the ecosystem literature results in an incomplete perspective on interventions to secure watershed ecosystem services and limits policy discussions in relation to alternative conservation approaches. It is vital that such alternatives are given more recognition in order to find effective solutions for the protection of natural capital in the future." More governmwent is always the wrong solution. How about when we go to war? Do you want a small government then? Strong be the stupid in this one, Padawan. Thermoidiot for president!! Bigger government and more wars.